Summary: Astrid Jones desperately wants to confide in someone, but her mother's pushiness and her father's lack of interest tell her they're the last people she can trust. Instead, Astrid spends hours lying on the backyard picnic table watching airplanes fly overhead. She doesn't know the passengers inside, but they're the only people who won't judge her when she asks them her most personal questions . . . like what it means that she's falling in love with a girl. 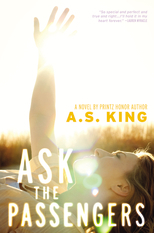 At its heart, ASK THE PASSENGERS is Astrid Jones' coming-of-age story. Astrid is a teenage girl who is keeping a pretty big secret -- she might be falling in love with another girl. She doesn't feel like she can talk to her critical mom or her hands-off father, so instead she lies on a picnic table looking at airplanes and imagines conversations with the non-judgmental passengers. Naturally, Astrid is torn between staying true to herself while possibly disappointing her family and friends, or hiding a significant part of her life from those closest to her. Truly, ASK THE PASSENGERS is a very special book and one that shouldn't be missed. But don't just take my word for it. ASK THE PASSENGERS has already been named a Publishers Weekly Best Book of 2012, a Fall 2012 Junior Library Guild Selection, and a Fall 2012 Indie Next List Pick. In addition, it's received starred reviews from Booklist, Kirkus Reviews, School Library Journal, Bulletin for the Center for Children’s Books, and Shelf Awareness. Without a doubt what stood out to me the most about ASK THE PASSENGERS was Astrid. Astrid is a just fantastic character and one that will remain in my thoughts for a very long time. I just adored her, yet my heart also went out to her because she was so conflicted about her own feelings as well as society's expectations. Astrid didn't understand why she had to be labeled as one thing or another, and I think she made some extremely compelling arguments against why humans feel that they have to do this. Astrid's character was extremely real to me, and I think all teenagers will be able to relate to her because she is so genuine. Any teen who has ever had questions about their sexuality will, of course, relate to Astrid; however, I think all teens will recognize their own insecurities in parts of Astrid's story. Almost everyone has had to face questions about how they fit into their family and/or society and how much of their personal feelings they should share with others. And I'm pretty sure that all teens (and even adults) have wondered why they are judged so harshly by others when it's really not anyone else's concern. Another wonderful thing about ASK THE PASSENGERS is how Ms. King decided to tell Astrid's story. The book is written in Astrid's voice, and I thought Ms. King nailed it. It goes back to how convincing Astrid is as a character, but I think Ms. King got her thoughts and actions perfectly right. In addition, I loved the brief chapters where Astrid imagined conversations with various passengers on the airplanes. Ms. King always manages to do something a little quirky in her books (like having chapters narrated by a pagoda in PLEASE IGNORE VERA DIETZ! ), and I've come to look forward to seeing how well these sections complement the rest of the story and its themes. And finally, I loved how much this book made me think! As far as I'm concerned, if I'm still thinking about a book and its characters days after finishing it, that really says something about just how powerful ASK THE PASSENGERS IS. Astrid opened my eyes to just how much pain and confusion a teen can feel, and I am now devoted to working on the relationships with my children so they won't feel like they can't approach me. I will work hard not to be like Astrid's mother (although I fear that I am more like her than I want to admit! ), and I will certainly aim to stop assigning labels to others. ASK THE PASSENGERS would make a wonderful book club selection for teens and quite possibly even mother/daughter clubs. Astrid and her sense of wanting to learn who she really should resonate with readers and generate some fantastic discussion. In addition, some other discussion worthy topics include parent/child relationships, first love, staying true to one's self, friendship, truth, judgmental attitudes, and acceptance. ASK THE PASSENGERS is one of the best young adult books that I've ever read, and I highly recommend it to teens and their parents. Oh, I must read this! Thanks for featuring it - I didn't know about it! I've had this on my list. Now I know I must read it. I agree with you about King's writing - she is probably the most creative young adult author out there. I love the fact that this book explores an issue so many kids struggle with. The parent/child relationships really nailed me in the gut. I've been encouraged to once again make sure I'm cultivating real relationships with my boys.